I’ve gushed before about my aunt and uncle’s incredible style, but I should also point out that they’re actually really incredible people with the style to match. Which is an opinion I would hold anyway, regardless of whether or not they gave me this awesome antique oriental rug last time I saw them. My uncle has been collecting antique oriental rugs for the last forty years and has amassed quite a collection. And the man knows everything about rugs, it’s pretty unreal. Not that I have any super incredible personal collections to speak of, but I think I understand the special bond one can develop with such objects– those things we might stumble upon or hunt for endlessly, the ones that make our little hearts sing when we find each other. So I was totally floored by the generosity of passing one of these rugs on to me. Anyway, I’ve been trying to educate myself on oriental rugs, but evidently I’m not a very good student. I can’t remember what this style of rug is called, despite having been told twice. I think it starts with an S (and it’s not a Sarouk, so don’t even say it). Don’t worry, I’ve slapped myself on your behalf and I’ll totally make it my business to find out. Here’s what I do know: it’s old. Like very old. And I like that. I like the frayed edges and the imperfections and the worn fibers. 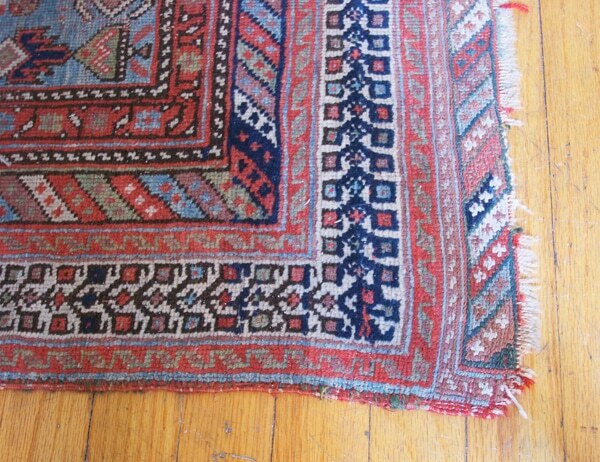 It’s actually a pile rug (with the exception of the couple inches on the right side of the above photo, where it’s flat-weave), but decades of traffic have given it almost the texture of a kilim. Third picture, just for funsies. I know these close-cropped photos don’t provide a very satisfying view of the space, but the surrounding living room still needs a significant amount of beautification. It’s not fair to me, to you, or to this gorgeous rug that the rest of this room should be so blah. So I’m trying to fix that. More on that mission very soon. Edit: Uncle Tom has set the record straight! “The rug is an Afshar from the Fars District of southern Persia and likely dates from the 1890-1910 era.” I told you he knows everything. “Snazzy”? Is that the word you’re looking for? I love that rug. It’s perfect. I wish my dogs had the same kind of respect for floor-bound textiles as I do, because I am really sick of living with bare floors. Alas. bahahaha, you sharp one, you. But actually that was completely unintentional, I feel so cheesy. Ohhh really nice. Please layer it with a jute rug underneath. Get your layer on! Woah, that definitely did not occur to me. That might be exactly what I need to do. Sewan Kazak? Hopefully rugmaster Uncle will put an end to the anticipation….The layering sounds nice. Ooh I like the idea of layering it with jute, great idea! Is it a Soumac /Soumak ? I have a 9×11 Soumac and I love it. I use a rug pad under it, so that it stays put on the wood floor. Beautiful!! And what a lovely coffee table I might add! 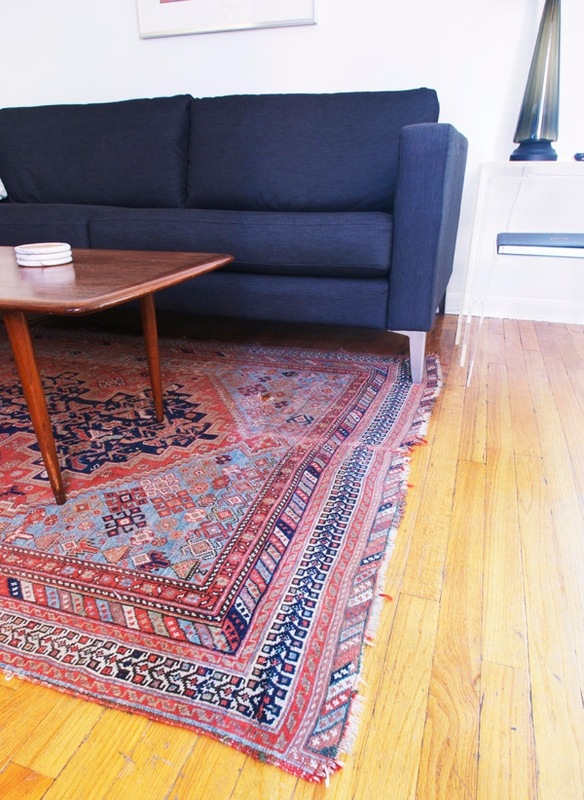 So awesome and yet vaguely creepy is that I’m moving into my first apartment…and I have a coffee table exactly like yours, bentwood chairs exactly like yours, a rug very vaguely like yours, and plans to buy a grey sofa and lucite nesting tables (again, like yours). Can we agree this is awesome and not creepy? Because I promise I live in Seattle and so couldn’t be spying. You, my dear, are a lucky duck. It’s a great rug. Your uncle is very kind to give that to you. A rug underlay will keep it in place, if you haven’t already got one. Daniel, Thanks for the kind words… And for not mentioning the large hole in the rug! 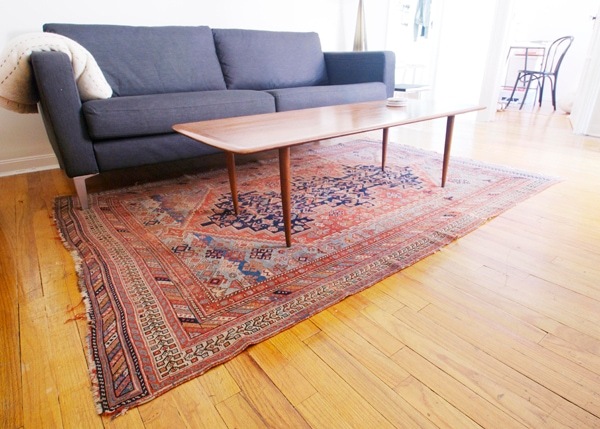 For the record the rug is an Afshar from the Fars District of southern Persia and likely dates the 1890-1910 era. The major city in the region is Shiraz and rugs from this area are often (and incorrectly) lumped into a category by that name. Actually there are numerous nomadic tribal groups that all have their distict weaving traditions and with a bit of study one can easily distinguish one from the other. Afshar rugs are often darkish in coloration and I always liked the light color, especially the sky blue, in this old piece. Afshar!!! I knew it started with an s. Or, well, there was an s in there somewhere… thanks for telling me again, this time I swear I’ll remember (and learn more about this subject in general, expect some pestering next time we’re together…). I love it. LOVE the rug. LOVE Uncle Tom and Aunt J, too. You are very fortunate to have family like that. Oh, and Uncle Tom’s knowledge of these heirlooms is pretty amazing, too. Learn all you can about every little piece! p.s. I love your blog and will pleasure to follow changes in your nest.